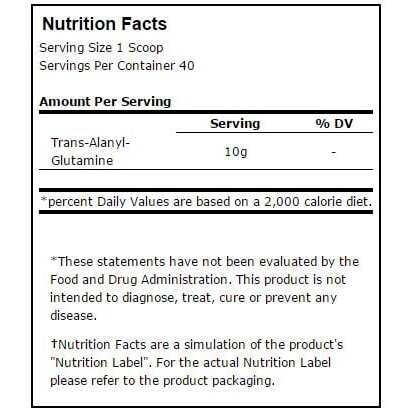 Trans Alanyl Glutamine (TAG) is a bodybuilding supplement from Metabolic Nutrition that provides stable and strong dipeptide chemical structure which enables the supplement to mix with water or other beverages without loss of chemical structure or any degradation*. The supplement is acclaimed by bodybuilders, athletes and consumers who demand superior, uncompromised and quality bodybuilding results and are looking forward to maximizing their physical enhancement*, increase muscle repair* and maintain overall health*. 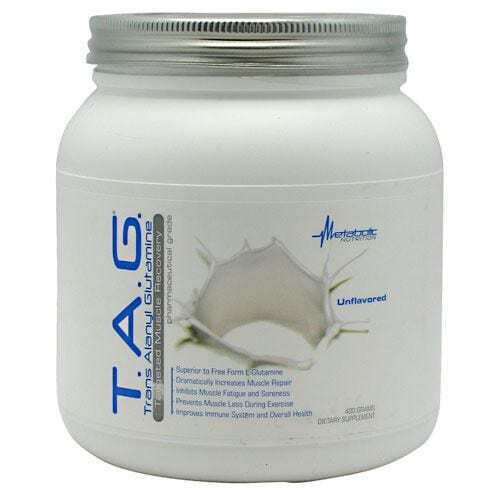 Metabolic Nutrition TAG has scientifically been formulated using natural ingredients that make the supplement to be the only Muscle Targeted Glutamine in the market today*. The product supplements the body’s need for glutamine*. The TAG supplement is 100% assimilated into the bloodstream after where it is transported directly to the muscle cells and becomes deeply infused into the muscle tissues*. The product has been designed to prevent protein catabolism*, prevent the loss of muscle glutamine during workouts* and increase recovery during and following a workout*. In addition, the product has been formulated to support the body’s immune system*, increase protein synthesis* and boost the synthesis and release of human growth hormone*. This makes it an important supplement for bodybuilders and athletes who need to increase their workout performance*, promote endurance* and increase muscle recovery*. 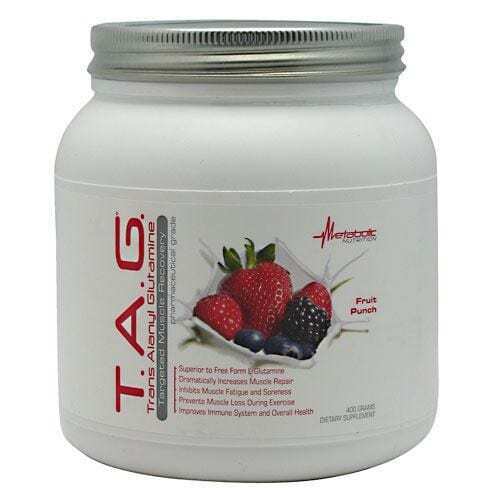 Metabolic Nutrition TAG promotes muscle development and increases body energy output* by solving four problems that stop natural glutamine from building muscles and increasing the body’s levels of growth hormone*. First, the supplement has been formulated using a stable and strong dipeptide chemical structure that prevents it from being degraded once mixed with water or other beverages*. This promotes its absorption through the small intestines*. Secondly, the supplement is directly assimilated into the bloodstream without requiring any digestion*. This means it will be 100% available for muscles*. Thirdly, the supplement has an exclusive bio-available structure*. The structure enables it to circulate through the body until every last gram is delivered into the muscle cells*. Lastly, the dipeptide chemical structure provides up to 99.8% of glutamine pool required by the muscles for growth and recovery*. TAG supplementation increases the body’s levels of glutamine* which in turn promotes nitrogen retention and prevents the loss of muscle protein*. According to research, various conditions such as burns*, infectious diseases* and surgery* can deplete the levels of glutamine by as much as 50%*. This calls for its supplementation through Metabolic Nutrition TAG. Suggested Use on Training Days: As a dietary supplement, take 1 scoop with 6-10 oz of cold water, juice or protein shake, before and after workouts. Suggested Use on Non-Training Days: As a dietary supplement, take 1 scoop with 6-10 oz of cold water, juice or protein shake, once per day. Note: For added immune support, anti-oxidant benefits, and accelerated muscular repair and whole body recovery, add 1 serving of T.A.G. to any protein, meal replacement, pre/intra/post-workout supplement*, or other Metabolic Nutrition products to further enhance desired results*.